Did you know April is National Soyfoods Month? In celebration of the month, I was challenged to swap out a dairy or meat-based ingredients in one of my favorite recipes with a soy-based food. Now that spring has hit we have been doing a lot of grilling so it made sense for me to take the challenge to the grill. One of our grill staples are burgers, there are just so many easy ways to customize them. Occasionally I swap out our meat burger for Morning Star Farms Spicy Black Bean burgers, not because I’m looking to make a soy swap but a) because they’re just SO good and I like my burgers a little spicy and b) I’m too lazy to do homemade black bean burgers. This time I decided to swap them out for the Morning Star Farms Veggie Burgers because they’re made for grilling. They were tasty but they needed just a bit of kick so I whipped up my special Tangy Burger sauce and decided to try a soy swap there too. 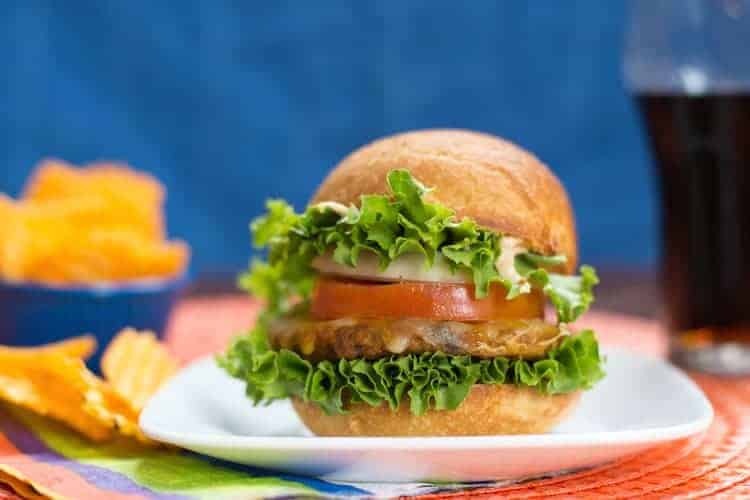 This tangy burger sauce is SO easy to make and almost all of the ingredients are something you would put in/on a burger anyhow! Usually, I would use Mayonnaise in place of the Soy Yogurt but the soy swapped worked perfectly here too. Optional – swap the White Vinegar for 1/4cup Dill Relish! Mix all of the ingredients in a bowl and then refrigerate before serving on your burger. This also makes a really great french fry drip! Find our more about Soy Swaps for dairy, meat and more on Soyfoods Association of North America’s Facebook, Twitter and Instagram. This sounds really good. I will have to try this out this summer when we are grilling. What a great recipe. The tangy sauce will change up a burger for anyone. Yummy! I don’t eat a lot of burgers but these seems pretty good. I’ll have to get this for the summer, would be perfect on a grilled burger.